A knight in shining armour for the time-poor and parched-of-hair, Sachajuan’s Intensive Hair Oil is a leave-in treatment that nurses stressed tresses back to their glossy, lustrous best. Infused with 11% Argan Oil. Sunflower Seed Oil and Rosemary Leaf Extract, just a few drops worked sparingly through damp hair help to seal in precious moisture, bestow an expensive, advert-worthy shine and envelope your headspace with a beautifully delicate, long-lasting fragrance. Alternatively, smooth just the tiniest bit through dry ends to calm frizz and protect against the ravages wrought by heat-styling. 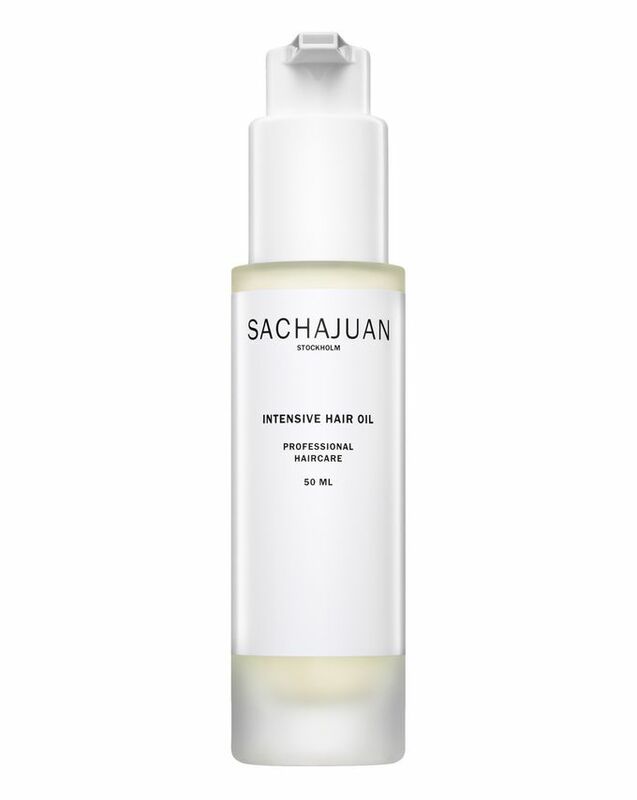 Perfect for revitalising dull, dry or damaged hair, without any parabens, sulphates or phthalates. Use sparingly on wet or dry hair as a therapeutic leave-in treatment or as a protective pre-styling foundation to all heat-styling techniques. Lightweight, doesn't make hair oily or greasy. The scent is amazing! This product works very well. It cures split ends and gives shine. I am happy with the purchase. Whilst this oil is quite lightweight and has a pleasant smell, it doesn’t do anything spectacular for my hair which has a tendency to be dry. It’s pleasant but definitely not life changing. There is no comparison. It’s not silicony, nor oily. It’s just hydrating and lightweight too, and it doesn’t make your hair look like it’s sticking together. One pump is enough. The scent is kinda soapy and it is amazing. For me, there is literally no comparison and I have tried so so so many hair oils and they all either feel oily or silicony and do nothing for your hair, but this one. I always dreamed of something that could make my hair feel soft and light without annoying split ends that ruins my life. But every time I tried hair oil it was just the total disappointment, cause it always weighted my hair down and I hate the feeling of oil in my hair. But THIS is a game changer. I mean it. Every time I use this I feel like I already come from the beauty salon, this is simply incredible. No words can describe this feeling. Every girl should try this if she wants to hear compliments ALL DAY LONG. Now I can't imagine my life without it. So much love, Sachajuan! I thought that being an oil that this product would weigh my fine coloured hair down but it has made my hair so soft, with a healthy shine and bounce to it. The smell is just divine too. I have tried numerous hair oils, but this is up there. The smell is beautiful, while still being quite light and I find that I can use it daily (use on dry hair in the mornings) and it keeps it looking glossy rather than 'wet' and oily. It hasn't totally got rid of my dry split ends, but I've definitely noticed an improvement in the texture of these - so that's a plus! Amazing scent and your hair looks very healthy. This is a luxury that I only allow myself occasionally but one of those products that's great for a little boost. Smells delectable. Disappears into hair with ease without weighing down. Sachajuan have outdone themselves here. Treat yourself! Is there nothing these guys can't do!! The Swedes have introduced another can't live without hair product. I'm always dubious about leave in products for my fine hair as most weigh it down, making it look limp and greasy. This oil just disappeared into my hair (I didn't put it anywhere near the roots) making it wonderfully soft and swooshy, and smelling heavenly. It's like Moroccanoil 2.0!